Description: CSX 8766 (ex-CR 5524) heads a northbound CSX train with an NS unit in tow. Description: Train is crossing Orange Avenue approaching Marks Street. It will again encounter Orange Avenue down by Taft Ramp. Description: Westbound off the connection behind a gevo. Description: Q364 and Q380 wait at CP 14 for permission east. Description: Q237 has replaced Q255 for Taft, returning to its previous route down the A-Line to Tampa. Progress continues around Stanton's trackwork. Description: CSX train Q549 negotiates the roller coaster profile of the Fitzgerald sub near Abba, GA. 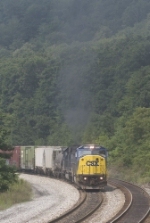 The characteristic SD60 full throttle "howling" of CSXT 8766 could be heard a full ten minutes before the train came into view.